The tight laneways of Saket in South Delhi, lined with sauntering cows and haphazard roadside fruit carts, are an unlikely gateway to one of the city's best-kept secrets. But walk a little further into the village of Saidulajab and you’ll find yourself in a Parisian-style passageway complete with design studio, tea rooms, cafes and laneway seating. 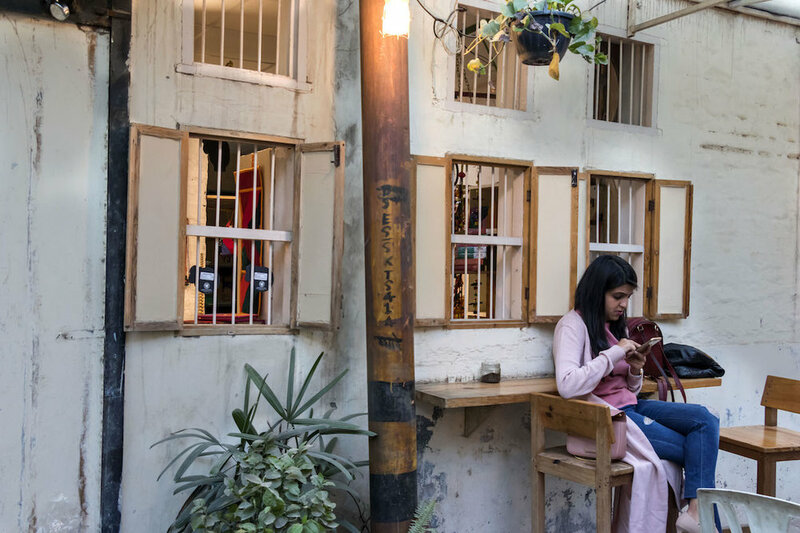 Don’t be surprised if you haven’t heard of Champa Gali, even locals are only just starting to uncover this creative Delhi hideaway. Until recently the poetically named Frangipani Lane was home to makeshift furniture stores, cow sheds and workshops, but it was transformed into the avant garde arts hub a couple of years ago and is slowly gaining in popularity. The community space holds a natural appeal for artists, writers and photographers who collect in the artisan coffee houses. Even though it’s been tried before, the success of turning a ramshackle village in Delhi into a cultural hot spot has given Champa Gali a feel all of its own. It’s only one street, but like the backstreets of European towns where the most creative and free-thinking cultures emerge, so it is with Champa Gali. The uni students with open laptops leaning against the whitewashed walls give the lane a youthful low-key vibrancy. Friends wander in and out of the little stores looking for original art pieces and handmade gifts. In the ambient reading room and tea house of Jugmug Thela, the owner calls himself the Chief Chaiwalla and is happiest serving customers his fusion chai blends and filling the space with spicy aromas. His was one of the first stores to open and Jiten Suchede is still the person most likely to share the secrets and history of Champa Gali with curious visitors. This thriving little village lane is a hub for meetings, both social and corporate, with plenty of places to inspire. There’s Blue Tokai Coffee Roasters, where the aroma of coffee catches you as you walk in. Patrons mull over projects and catch up along the communal table that acts as the room's centrepiece, while the shaded courtyard at the back is abuzz with chatter. If your taste buds seek something more, then the fusion flavours of Pho King Awesome will take you on a whirlwind trip around the world. With a mix of Asian, Mexican and Indian dishes it tastes like the Spice Route but feels like a rustic cafe and looks something like Mykonos. By day the street has a lovely rural feel, a fleeting escape from the jumble of mainstream Delhi just blocks away. Occasionally in the evening it comes alive with pop up events and offbeat music programs. 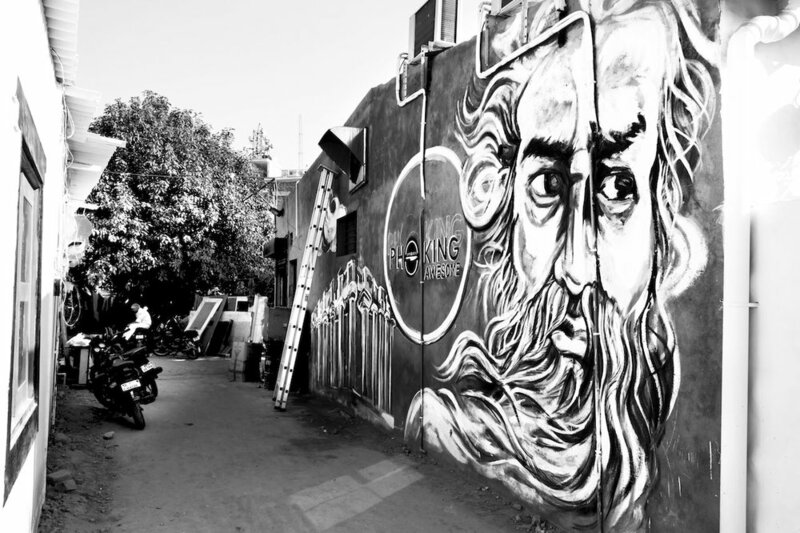 Hosting art exhibitions, poetry and music nights, Champa Gali shares its soulful, blended experience with those looking for the unceremonious side of Delhi. And it’s blossoming into a liberating little urban neighbourhood along the way. You can find more of 2gals work by clicking here.